OK, the holidays are fast approaching, and it's time to let go of some of those debilitating worries about being all PC. At my school, for the 11th straight year, the men are preparing for The Men's Cookie Exchange. If you are a male teacher in a school, please consider organizing the guys - and sending us your story/recipes/pictures/video! We will share it on our web site and our wiki!. Gosh, a few years ago we even had Sara Moulton feature us in a Food Network Special. 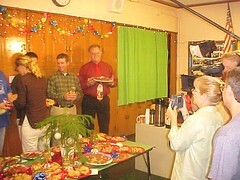 Here Sara takes a picture of us during a break in the filming in my classroom. She spent the day with her crew at my house and in my classroom. We play the video of the special every year at our event. We've definitely had our 15 minutes! Be sure to check out: Dave's Christmas Crunch Cookies and my Toffee Bars - both featured in the show. We may have eight bakers this year! Guys, please join in! Our results will be posted on the web, the wiki, and YouTube, of course. FW: New Feature: "Teacher Assignments"
Alumni - Your Blogs are Back!